Bleeds in printing can have a dramatic affect yet without proper setup can lead to disastrous results. Once you understand the underlying concept, achieving a proper bleed can be simple with the Adobe line of products. 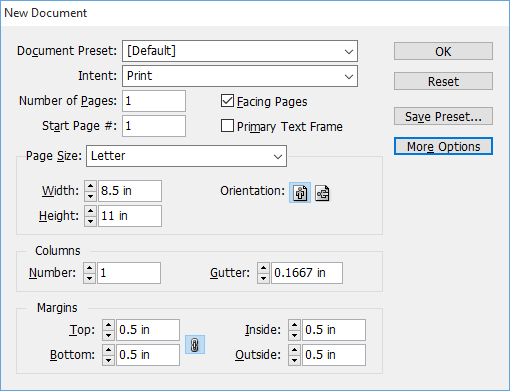 A bleed in printing is when the ink of a printed item touches the edge of the page. You can think of this as the ink is bleeding off the edge of the page. Items that commonly have bleeds are business cards, flyers and banners. It is also not unheard of to have a letterhead or envelope with a bleed however this may increase the cost of your job. The reasoning for this increased cost will be self evident as we explain how a bleed is produced. It is always a good idea to check with your printer for the required bleed settings if applicable, for some items you may not need them. For instance here at Miss Print we do not require a bleed for Posters and Banners. How a bleed is produced, output point of view. The act of producing a bleed is itself very simple. One produces the artwork on an over-sized sheet and then reduces the size of the sheet. For example a letterhead with a bleed is printed on a larger size sheet of paper, the bleed area extends beyond our cut marks. Once we cut down the sheet the ink will appear to have been printed to the edge of the sheet. 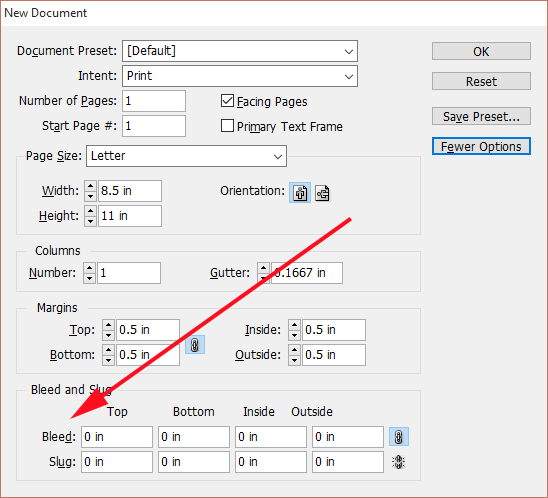 One question is why do we produce a bleed this way and not just print to the edge of the sheet? While a simple solution there are a few technical reasons to not produce a bleed this way. You may have noticed on your printer at home that if you try to print a full sheet you have a specific areas that will not print. This is commonly called the non-printable area and is used for the printer to “grip” the page and pull it thru the printer. The press term for this is “gripper area”. While some modern printers do offer “border-less printing” you usually sacrifice render time and if the sheet is not perfectly loaded one has a huge mess of ink to contend with. Even large printing presses have a gripper area. The presses we use at Miss Print require one edge to be gripped. while you could put ink to the edge three sides of the sheet this is a messy and time consuming process, it is more cost effective to print over-sized and cut down the sheet. How a bleed is produced, Pre-Press point of view. 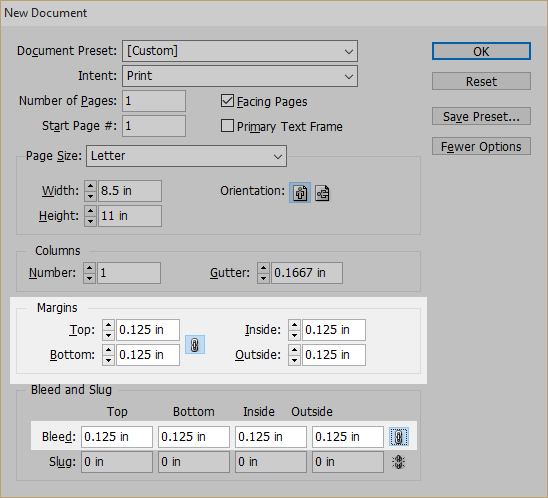 Producing a bleed in many commercial graphic design and desktop publishing packages is easier than most people would think. For our examples today we will look at Adobe Illustrator and InDesign. While you technically could set up a bleed in Photoshop it is not as intuitive as the other Adobe products, there are cases where you will need to setup images to be used in bleeds however that will be a bit more self evident once we have the bleeds setup in our other products. That aside, it is generally considered bad practice to submit a Photoshop file or a bitmap in general for output. Below we have the “New Document Dialog”. 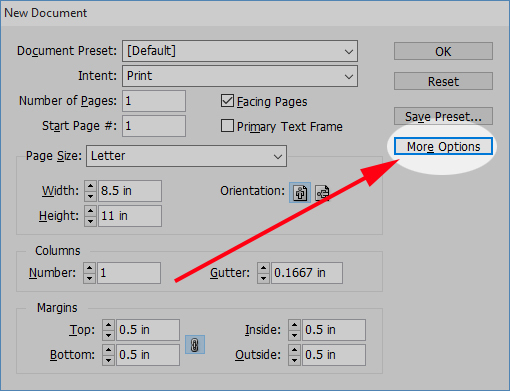 This should be very familiar for anybody who has worked with InDesign however one of the hidden options in this dialog allows us to create our bleed right from the start. For this example I already have my preferences set for Inches to be used on the Horizontal and Vertical in the Ruler Units. You can change the example to your preferred point or metric values and it will work out the same, alternatively if you wish to change the default settings it can be found under Edit>Preferences>Units&Increments. To see our extended options just click on the “More Options” button. You will now notice that two new options appear at the bottom of our dialog, the settings for Bleed and Slug. We can ignore Slug for now as it is mostly used by printers for internal notation. The settings for bleed can be either “Top, Bottom, Inside and Outside” or “Top, Bottom, Left, Right” depending on if you have facing pages selected and will have their values linked by default. Very rarely will you have a bleed that is different sizes on any of the edges however it is good to know you can alter this if needed. I also want to modify another setting before we click OK. 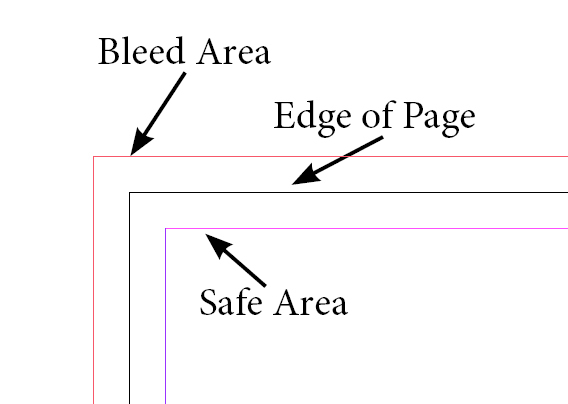 Since we have our bleed and page size, we want to include a “safety area”. This area is the boundary of where we will let any prevalent information pass. Any important information such as our body copy or needed photographs shall stay within these bounds. For this setting we will use our Margin (alternatively you could just use regular guide lines if you need to use your margin for other reasons). A good area for our “safety area” is also .125 inches. After this we are OK to create a new document with our guidelines all set up for bleeds. 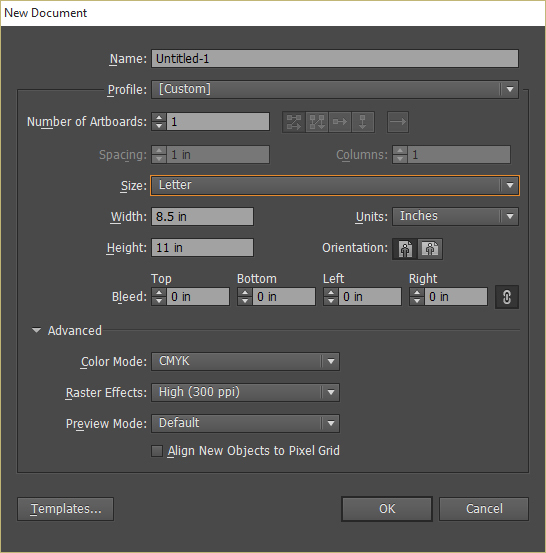 Producing a bleed in Adobe Illustrator is a relatively simple process. 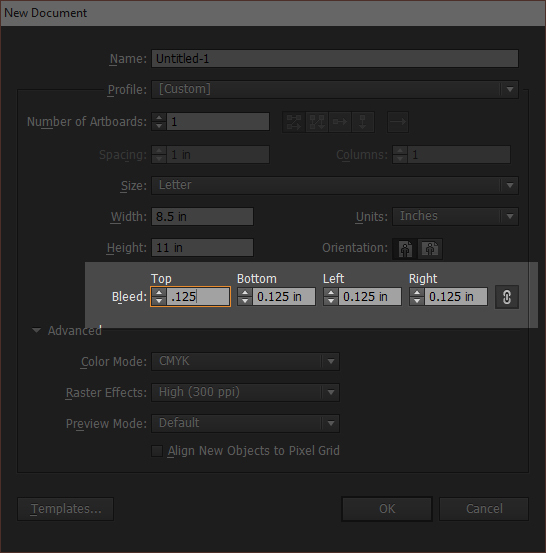 As we can see in our New Document dialog there is a setting for bleed already present. For this example we will give it the same area as we did in our previous example, .125″ on each edge. At this point you can chose to just pull out your guidelines for the safe area or to speed things up we can create a shape the size of our safe area and convert it to a guide. There is a very easy way to achieve this. 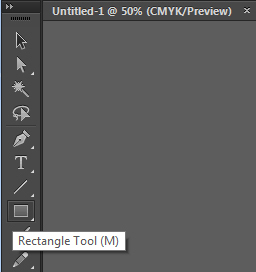 First select the rectangle tool and just click (do not drag) anywhere on the paste board. This will bring up the Rectangle Dialog. From here you can just fill in the area of the rectangle for the safety area. 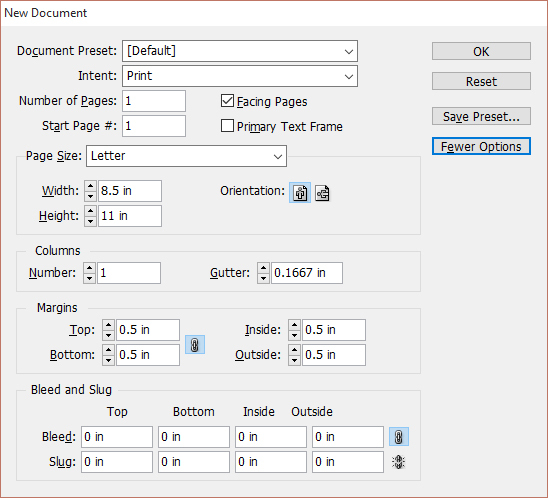 Just take your page size, in our case 8.5×11″ as a standard sheet of paper and subtract .25″ from the total on each size. “Why .25 inches?” some of you may be wondering, it is because we are reducing for both sides of the paper at this point. 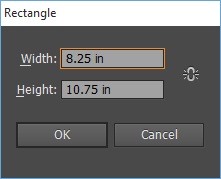 You could straight input 8.25 for the width and 10.75 for the height or type in 8.5-.25 and 11-.25 and illustrator will do the math for you. After our new rectangle appears on the page we will want to center it inside our page with the alignment panel. From here we just need to right click on our rectangle and select “make guides” and we are done. Setting up bleed settings if needed can save you time, money and headache in the long run. By communicating beforehand with your printer to define the scope of your project and if a bleed would be required you can avoid costly delays and additional charges that could otherwise be easily avoided.